Does anybody know the famous refrain “Ma tu vulive ʼa pizza,ʼa pizza,ʼa pizza c’ ʼa pummarola ʼncoppa c’ ʼa pummarola ʼncoppa”? Neither a diamond ring nor a grilled mullet eaten in the best restaurants on the sea and not even the five tier wedding cake can distract the singer’s girlfriend from her single desire: ʼa pizza. It was 1966 when, while the Beatles phenomenon was going around the world, this song seduced the audience of the XIV Festival of Neapolitan Song, winning the silver medal. 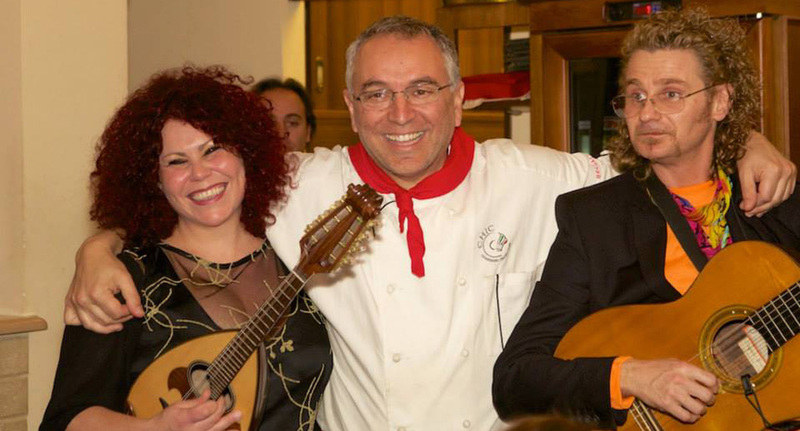 This, which was performed by the duo Giorgio Gaber and Aurelio Fierro, is, however, only one of the latest songs that have been inspired by the most famous and imitated symbol of Naples. Hot pizzas, pizzas co ll’aglio, ll’uoglio e ‘o ciceniello ‘e mare (with garlic, oil and whitebaits), pizzas c’ ʼa n’zogna, co l’alice o c’ ʼo fungetiello (with suet, anchovies or mushrooms), pizzas cu’ ʼa muzzarella e c’ ʼa pummarola ʼncoppa (with mozzarella and tomatoes), more scented than the pastiera or the sfogliatella, soft as a brioche: this is the pizza identikit at the time of the ten songs analyzed by Tommaso Esposito in «ʼA Pizza, viaggio nella canzone napoletana». Dusting off old scores, the author, a journalist and psychiatrist, reassembled a musical collection that ranges among about five centuries: with the oldest dating back to 1500, notes and verses lead the reader on a journey into the past to discover the history of the Neapolitan pizza and its changes. In the enclosed cd, some of the greatest performers of the Neapolitan music, from Salvatore di Giacomo to Giovanni Capurro, from E. A. Mario to Domenico Modugno, relive thanks to Enzo Sirletti’s arrangements and Floriana D’Andrea’s voice. An evening of music and, of course, pizzas, the one organized at La Notizia on February 17th for the presentation of the book. As in the days of the Piedigrotta festival, these songs, performed by the Neapolitan duo, hit the participants dragging clappings and a frisky chorus. For the occasion, the master Enzo Coccia unsheathed some of his “trump cards”: Margherita DOP, Cosacca (oil, tomato and pecorino cheese), Crusco peppers, smoked buffalo mozzarella, lard and friarielli and his unfailing forte, the murzillo saporito. Then, a very welcome surprise to the singer of a handmade mandolin, which she promptly rang, made by one of the city latest lute makers.